SOLUTION TUBE ID - W/SAF-T-SEAL 0.546"
SOLUTION TUBE ID - W/O SAF-T-SEAL 0.622"
Note: Availability of the SAF-T-Seal tip with the selection of titanium tube material is subject to change. Inquire prior to selecting. 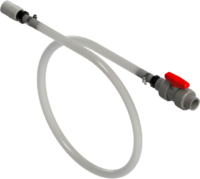 Available separately, flexible hose assemblies help take the guess work out of connecting to a chemical feed when installing. Additionally, by avoiding multiple rigid fittings, the assemblies can improve the ease of use when inserting and retracting the solution tube. Availability of SAF-T-Seal tip with selection of titanium solution tube material is subject to change. Inquire prior to selecting.